The RIDERS series are a set of eight books written by Samantha Alexander, author of the popular Hollywell Stables series. RIDERS follows the story of the central character Alexandra Johnson, her boyfriend, friends and trainers together with their respective ponies and horses. The novels are set in the competitive, adrenalin filled and sometimes dangerous equestrian world of three day eventing. Each RIDERS title continues the story of Alex with her dream to become a top class eventer. We follow Alex’s eventing career from its early beginnings to her time as a more experienced competitor and join her in the many challenges which she faces along the way. The RIDERS series are British books which are mainly set in the competition and livery yard where Alex keeps her pony Barney, together with her training days at the Sutton Vale Pony Club of which she is a member and of course the many different competition grounds where she finds herself competing. 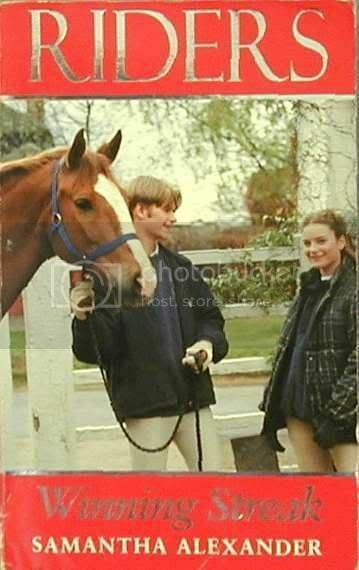 Alexandra Johnson – Alex is aged 14 years old and owns a pony of much character named Barney. Alex is a friendly, level headed but ambitious girl who shows much determination and courage in her dream to become a champion three day eventer. Ash Burgess – Ash is Alex’s handsome boyfriend, aged 19 years. He runs the competition and livery yard where Alex keeps Barney. Ash is an experienced rider who also competes in three day eventing with his own horses together with those of his clients. Eric Burgess – Eric is Alex’s trainer and also Ash’s uncle. A well renowned horseman, he was paralysed in a riding accident and is now wheelchair bound. Eric has seen the potential in Alex right from the start and it is his talent, knowledge and eagle eye that helps Alex become a top class rider. Zoe Jackson – Zoe is Alex’s best friend, aged 15 years. She has a pony named Lace but does not have the ambition to become a champion rider. Zoe is a true best friend and is always there to support Alex in her endeavours. She has a sweet but somewhat scatty disposition with a great sense of humour. Camilla Davies – A friend of both Alex and Zoe, who is 16 years old. Camilla owns a pony called The Hawk. Although Camilla loves her pony and enjoys riding, she is also of the age where boys are a very important part of her life. As opposed horses, much of her problems seem to revolve around boyfriends, or in some instances, the lack of. The books reviewed were RIDERS no. 3 Peak Performance and RIDERS no. 8 Winning Streak. Although I have only read two titles out of the entire series of eight, I have attempted to provide a review which I hope will fairly summarise the entire concept of the series. After finishing both Peak Performance and Winning Streak I came to the same conclusion. Firstly, I enjoyed the books! To me, the two novels were an interesting mix of a few different concepts - equestrian competition and training; personal difficulties and challenges; relationships with friends and boyfriends were all featured, together with a little mystery, adventure and action. I felt the author was able to subtly yet seamlessly blend these topics together which made for a terrific read. Although I do not (yet!) compete in the discipline of three day eventing which the RIDERS books are based upon, I thoroughly enjoyed the many training and competition scenes which appeared in great detail throughout the books. As an avid rider, this was to me the major highlight. I am pleased to state that the author’s knowledgeable, concise and exciting style of writing has raised both my awareness and interest in three day eventing. In particular there is a very handy glossary which appears at the end of the books. I thought this was a smart and considerate move on the author’s part which was most beneficial in helping me grasp the more technical terms of eventing, ie the different types of fences which a horse and rider may face when competing. Another tactic used by the author which I thought to be very clever was the cameo appearance of a couple of (her own) Hollywell Stables characters in Peak Performance. The appearance of the Hollywell personalities was not entirely without its place as they were linked to a major character in the book. Having read some of the Hollywell books, it was a further simple yet effective touch that I enjoyed very much so. I enjoyed the RIDERS books for their real take on life together with the well paced storylines. Nothing appeared to be far fetched in the books, I could picture all of the events actually occuring – without giving too much away, the world of equestrian competition is not always fair or kind! The novels were very easy to read and I was able to read both Peak Performance and Winning Streak in one sitting. My favourite element of the novels was without doubt the competition and training scenes of both horse and rider. As a more mature reader the sections touching upon boyfriend issues and teenage angst did not appeal so much, but for younger readers this would probably not be the case - if anything they may serve as a highlight. As mentioned above, I have a positive feeling towards the books for their clever combination of topics. I also felt the author had put a high amount of time into creating believable characters. There was not one character whom I felt was out of place in the books. In my opinion the major character, Alex Johnson, will greatly appeal to all young riders who can identify and share in her dream together with the associated ups and downs of becoming a champion three day event rider. Additional strengths of the books are that they are written in first person, which in my opinion makes for a more believable and involving read, together with the fact they are part of a series. It may be personal preference, but I always enjoy books where one can follow the story of a favourite character throughout a series, to me it makes for a terrific ongoing saga where there is always something more to look forward to! I would recommend the RIDERS series of books to any pony mad reader, but particularly those aged between 12-20 whose main interest in life is competing in eventing and horse trials. Not only are the books a great read, but as an added advantage I feel most readers will also find the RIDERS series refreshing, encouraging and useful in helping them to improve their own riding skills and techniques – I know I certainly enjoyed learning more about eventing along the way! As such not only am I hoping to shortly commence my own jumping lessons, (wish me well!) but I am also very eager to read further books in the same series. I convinced myself I would hate these but they are actually very good. They bring pony books nicely into the 21st century I think. Unlike Heartland, Half Moon Ranch, TB etc they have a more traditional pony story feel (of the Pullein thompson, berrisford etc variaty), revamped for the 90's, with the all important love interest added to keep youngsters happy. Voted excellent as I did enjoy them and I think there were just perfect for the market they were written for. Traditional style pony book and then the romance it seems is needed to entertian modern youth added (abeit a bit unbeliveable but when you were 14 a good dream! ).